Examples of post sent / received with Upper Deal postmarks. 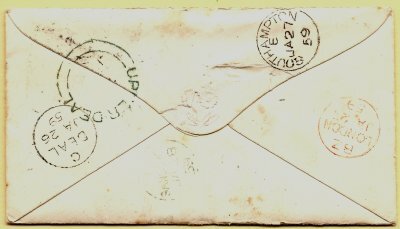 First cover posted 29th Jan 1851 from Kilmarnock to Miss M Duthie, Rectory, Upper Deal. The Rector was Archibald Hamilton Duthie from Jan 13th 1846 to Nov 2nd 1852. He died whilst on holiday in Scotland, but buried in St Leonard's Churchyard. 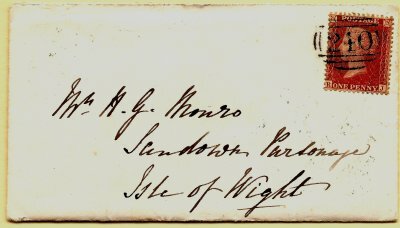 Second cover posted Jan 26th 1859 to the Parsonage, Isle of Wight. Sent from the Rectory, Upper Deal from the letter inside. The circular undated double arc of the UPPER DEAL mark style was in use from 1820 but its use in Upper Deal is not listed in Whitney's Postmark catalogue (5th edition). Does anyone have earlier or later examples with the Upper Deal mark? Collins Discovering Deal has 'Jenkins Well' used sometime as the post office (no dates). 20th Century places are easier - Pain Street Directory has the Upper Deal post office at Vine House, 222 London Road, 'Grocer and Post Office' over many years. Philatelic contributions by Alan Buckman.